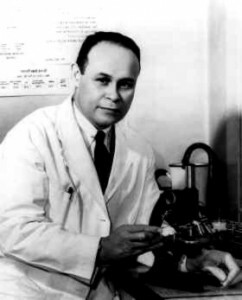 1904 – 1950 Charles Richard Drew achieved an unprecedented level of success for an African American of his era in the medical and scientific communities. His inventive and pioneering work with the storage and shipment of blood plasma saved hundreds of lives during World War II, and led to the first Red Cross blood bank initiative. Along with the thousands of Black physicians and surgeons whose path was opened by Drew, virtually anyone receiving a blood transfusion today is the direct beneficiary of his work. Drew was born in 1904 in Foggy Bottom, a Black neighborhood of Washington. D.C. He was the oldest of five children of Nora (a teacher) and Richard Drew (a carpet layer). Throughout elementary and high school, Drew demonstrated strong academic and athletic prowess. He graduated in 1922 from Paul Laurence Dunbar High School with the James E. Walker Memorial Medal for athletic performance, and an athletic scholarship to Amherst College. His studies and sports continued strong at Amherst, where he would be one of only 16 Blacks to matriculate during the 1920’s. He was captain of the track team, and earned a trophy as the football team’s most valuable player. Upon graduation in 1926 he decided to apply to medical school, but was forced to work for two years as a professor of chemistry and biology at Morgan State College in Maryland to save enough money to attend. When Drew made his applications in 1928, very few medical schools accepted Blacks. Howard University rejected him, due to a lack of English credits on his transcript, and Harvard accepted him for the following year. When McGill University in Montreal, Canada accepted him for immediate enrollment, he seized the opportunity to begin his medical education. At McGill, he began his pioneering research into blood transfusions under the supervision of Dr. John Beattie, a visiting professor from England. His academic achievements continued, with his election to Alpha Phi Omega, the honorary medical society, and an annual prize in neuroanatomy in 1930. Graduating in 1933 with a Medical Degree and Master of Surgery degree, Drew served an internship at the Royal Victoria Hospital and a residency at Montreal General Hospital. His father’s death in 1934 motivated him to return to Washington, where he taught pathology at Howard University Medical School and served a residency at its affiliated Freedmens Hospital. Drew was awarded a Rockefeller Fellowship in 1938 and moved to New York’s Columbia University to continue his research in blood storage. At that time, blood would spoil if stored for more than seven days, making transfusions difficult. He supervised a blood bank at Columbia Medical Center, and developed a method for reducing blood to “plasma” (a modified form without red blood cells), which could be reconstituted by adding water when need for transfusion. His doctoral dissertation, “Banked Blood: A Study in Blood Preservation,” showed that plasma lasted longer than whole blood and could be shipped long distances without spoilage. He earned his Doctor of Science in Surgery degree in 1940, the first African American to do so, and was asked to serve as medical supervisor on the “Blood for Britain” campaign to meet the urgent need for large amounts of plasma to save soldiers’ lives in World War II. His success in that effort led to his appointment as Director of the American Red Cross Blood Bank in New York and Assistant Director of the National Research Council, heading an ambitious initiative to collect blood from 100,000 donors for the U.S. Army and Navy. Drew married Lenore Robbins in 1939, and they would have four children over the coming years. But his professional accomplishments were undercut by the forces of prejudice: the military instructed the Red Cross that only white blood donors were acceptable for white soldiers. Drew renounced the racist program in strictly scientific terms. He held a press conference, and demonstrated that there is no difference between the blood of different races, adding that the policy was “a stupid blunder.” Indeed, many soldiers would die needlessly by being forced to wait for “same race” blood. Because of his stance on the subject, he was asked to resign his position with the Red Cross, and returned to teaching in Washington. He became professor of surgery at Howard in 1941, was the first Black examiner on the American Board of Surgery in 1943, was awarded the Spingarn Medal by the NAACP in 1944, published extensively in scientific journals, and was elected Fellow to the International College of Surgeons in 1946. He was part of a team of physicians touring hospital facilities in occupied Europe as a consultant to the U.S. Surgeon General, and was a member of the America-Soviet Science Commission. The Spingarn citation stated, in part: “Dr. Drew set up and ran the blood plasma bank in the Presbyterian Hospital in New York City which served as one of the models for the widespread system of blood banks now in operation for the American Red Cross.” He was awarded honorary degrees from Virginia State College and Amherst. Drew died at the age of 45 in 1950 in a tragic car accident, en route to a conference at Tuskegee Institute’s Founder’s Day celebrations. Press reports stated that he was refused a needed transfusion at the nearest whites-only hospital, and died because of the delay in traveling to another that would treat Blacks. Other accounts indicate he died as a result of the injuries sustained. But the irony and prejudicial tenor of the times ring true, and underscore the lasting contributions made by Drew. He himself felt that his greatest contribution to medicine was teaching and advancing hundreds of Black surgeons. He created opportunities for, and gave inspiration to countless more. What a wonderful man. I just finished helping my 8 yr old daughter write a report on Dr. Drew and learned a lot myself that never crossed my mind despite working in surgery as a CST. This man faced more trials than I could ever have imagined and just kept going! I had 3 children while going to school and was the oldest in my class, wow, nothing compared to what he had to endure through his life and formative years.